Mr. De Santo is a partner in the Vineland law firm of Gruccio, Pepper, De Santo & Ruth. He received a Bachelor of Arts Degree in Business Education from Trenton State College, where he was active in numerous organizations and committees. He served in the U.S. Army and, thereafter entered the Rutgers University School of Law, where he received his Juris Doctor Degree. Mr. De Santo served as Associate Solicitor for the City of Vineland from 1980-1988. He was Secretary of the New Jersey Supreme Court Fee Arbitration Committee from 1982-1985, and a member of the Supreme Court District I Ethics Committee from 1993-1996. He served as Trustee (1984-1986), Vice-President (1986-1987) and President (1987-1988) of the Cumberland County Bar Association. He currently serves as Solicitor to the Vineland Board of Education, a position he has held since 1988. He is a former Board member of the American Trial Lawyers Association of New Jersey. Mr. De Santo is a charter member and Past President of the American Board of Trial Advocates - South Jersey Chapter. Mr. De Santo was honored by the New Jersey Commission on Professionalism with it prestigious Professional Lawyer of the Year Award for 2002, and as a “Top Attorney by New Jersey Monthly Magazine from 2005-2016. His peer rating is “AV” by Martindale-Hubbel the highest attorney peer rating designated by that lawyer rating service. Mr. De Santo is certified by the New Jersey State Supreme Court Board on Trial Certification as a Certified Civil Trial Attorney. His practice includes an emphasis in construction litigation, commercial litigation, real estate and business transactions. He has served for over 15 years as a court appointed mediator in various New Jersey counties. Mr. De Santo served on the Board of Directors of the Greater Vineland Chamber of Commerce for 13 years including a two-year term as President. He served on the Board of Directors of the Vineland Downtown Improvement District/Main Street for 11 years including three years as Chairman. 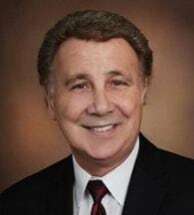 He currently serves as a member of the Board of Directors of the Vineland YMCA and the Board of Trustees of the Cumberland County College Foundation, where he is serving a two-year term as Chairman. Mr. De Santo was a founding member of the Italian American Benevolent Association and serves as advisor to the Board of Trustees. The Association provides scholarships to eligible high school students and financial assistance to disabled individuals and needy families. He also is an active member of the Rotary Club of Vineland. He was honored by the newspaper The GrapeVine as a “Hometown Hero” in 2010, by the Italian Cultural Foundation with its 2011 Spirit of Achievement Award, and by the Vineland Downtown Improvement District/Main Street with its Volunteer Recognition Award in 2017.